A new house and workshops around a central courtyard built inside an old brickyard and tucked behind lively Lordship Lane in East Dulwich, London. 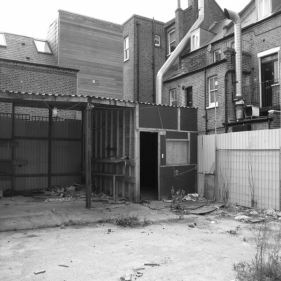 The choice of materials arose from the robust character of the adjacent brick buildings and the informal, not to say scruffy, qualities of the ‘back-yard’ site. Within the irregular, constrained site the courtyard is expressed as a formal, ordered space while the main entrance is placed centrally on the main elevation giving the house a dignified character – a ‘noble shed’. Lined in translucent polycarbonate panels the courtyard becomes the primary space around which the life of the house revolves – an outdoor room to which all the main interior spaces are connected.